Frame and Box Spring not included. YOU HAVE TWO SHIPPING OPTIONS: Due to the size of these items we offer two methods of shipment. $125 delivery and setup to most Los Angeles, Orange, Riverside and San Diego Addresses. 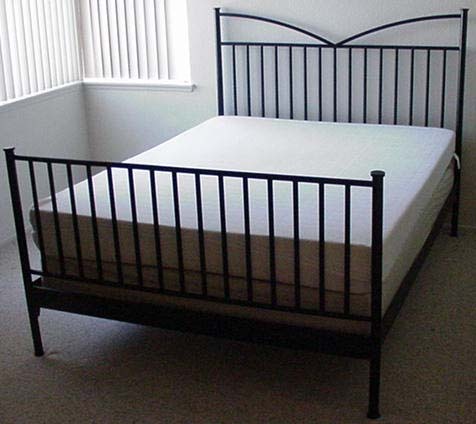 We do not currently sell box springs or bed frames. NEW DELUXE ORGANIC COTTON COVERS ARE NOW AVAILABLE! PLEASE SPECIFY IN THE SPECIAL INSTRUCTIONS WHICH SHIPPING METHOD YOU PREFER! FREE MEMORY LITE PILLOW WITH EVERY MATTRESS ORDER!! Click here to compare our mattress to a standard mattress. VITALFOAM MEMORY FOAM MATTRESSES - Firmer 5 lb density visco-elastic foam as compared to our Memory Lite Mattress. Made of same revolutionary technology as our Memory Pillows (Compare to Swedish Style). Our Mattress provides equal distribution, superior pressure point relief and cervical alignment for optimum sleeping comfort. The visco-elastic foam is hypoallergenic, antibacterial, antifungal and ozone resistant. It reacts to the temperature of the body to form to the head, neck and body, giving proper support while maintaining softness. Price includes a zippered terry cloth cover. Uncovered pads are also available. Replacement 3" Mattress Pad and 8" Mattress zippered terry cloth covers can also be purchased. Order your memory foam samples here. Our Memory Mattress foam is an open-celled, visco-elastic, temperature-sensitive material that senses body weight and body temperature and then automatically adjusts and completely supports the user. This revolutionary material relieves the pressure that causes poor sleep; tossing and turning; and aches and pains. It is, without a doubt, a space-age material. Our Memory 5lb mattress pads are 3" of solid 100% memory 5lb /10 ILD visco-elastic foam. Our Memory 5lb Foam Mattress consists of a 3" memory foam topper and a 5" foam base bonded together in a zippered allergy free cover. The mattress foam foundation is a 5" thick piece of 2.1 high density poly-foam. We can make custom mattress sizes and thicknesses!! All of our products come with a 30 day guarantee. If for any reason, you want to return your mattress or mattress pad, simple return it to us for a refund of the the purchase price less S/H and a 10% restocking fee - no questions asked. Note: If you have a doctor's prescription, Medicare may pay up to $500 toward the purchase of our Memory Mattress pads and Mattresses.